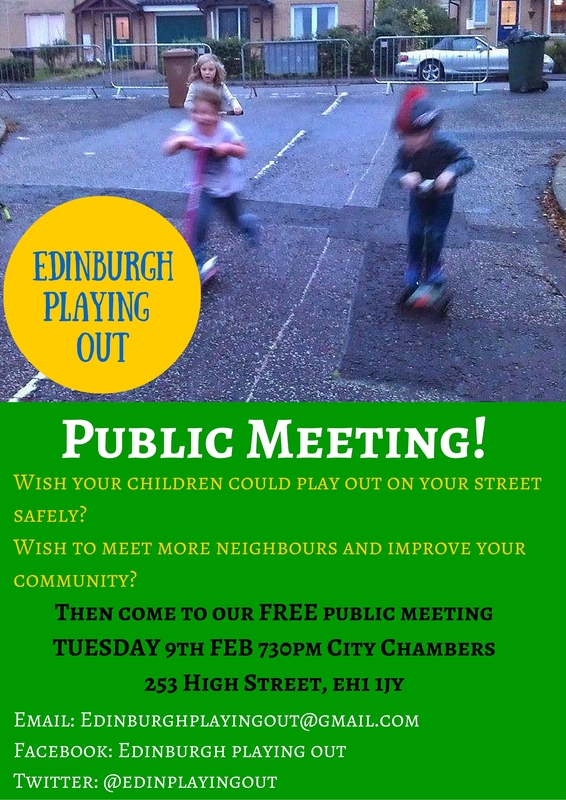 Playing Out is a way of reclaiming our city streets for children to play safely and for all age groups to come out of their houses and speak to their neighbours. It involves closing streets on a regular basis (this is flexible, but could be one afternoon a month) and allowing children, under the supervision of their parents, to play outdoors. Unstructured outdoor play with all age groups is important for children’s development. Streets which already organise playing out see an increased sense of community and responsibility Residents’ cars, delivery vehicles etc are still allowed access, it is just through traffic which is prevented from using the road. Please forward the poster below to anyone you think might be interested. Please see our Edinburgh Playing Out Facebook page too. This entry was posted in News and Events and tagged Edinburgh Council, Public events. Bookmark the permalink.